I am a monthly and weekly planner by nature. I just need to see an overview of how I am to spend my time. Using my monthly pages for appointments and time-specific events and my weekly pages for tasks forces me to stay reasonable about the amount of stuff that I plan. If I used daily pages all the time instead, I'd fill them up, over-commit, and never get everything that was written down on the daily pages accomplished. Instead, I make daily plans only when needed (most weekdays) and only make daily plans one day in advance (usually the night before). There are many advantages to the system of making daily pages only a day in advance, in addition to the ability to see an overview on my monthly and weekly pages. I can make better decisions about how to spend my time at the last minute, as the night before is when I have the most information about what is really coming up the next day. Most of the rescheduling is already done by the time I write my daily page the night before. If I made a daily plan three days in advance, and accepted a job substitute teaching at the last minute, I'd now have to redo the entire daily page. Usually, by the night before, I know what I am doing tomorrow at a pretty reliable level. Also, I am more aware of my health and energy levels the night before than I would be several days in advance. If I am coming down with a cold, I might schedule yoga class (8 a.m.) instead of my normal step class (10 a.m.). That bit of knowledge changes my entire schedule. Recopying the monthly and weekly entries onto my daily plan helps me to solidify my goals for the day in my brain. Right before I do the tasks and follow the schedule, I get a review of what is actually on the agenda. My memory of what needs to be done is refreshed, even if I actually wrote down the appointments or tasks months ago. With my daily plan in front of me, it is quick and easy to pack whatever I need for tomorrow. On a busy day, that can include food, workout gear, work tote, and errands totes, in addition to my purse and cell phone. Since I don't carry around months worth of daily pages, my planner is lighter and easier to carry, but still with the advantages of a daily plan. My daily plan set-up can vary a bit from day-to-day since I only make it one day in advance. For example, generally I only have less than five things on my agenda (like 6:45 a.m. carpool, 7:45 a.m. walk with friends, 10 a.m. - 1 p.m. substitute teach, and 5 p.m. karate with the kids). I fill in stuff like work hours and when to blog in the open slots. But, sometimes, I have more appointments than that. Instead of putting appointments in the tiny space at the top of my Quo Vadis pages, I might list 10 different appointments in the main space of the page. Or, for my sister's baby shower tomorrow, I can list everything that I need to bring (ice, chairs, foods, gifts, checkbook, etc.) right there on the daily page, where I would usually put the menu. On more relaxed days (say a Saturday with nothing on the agenda), I can simply rely on my weeklies and not waste time making a daily plan. 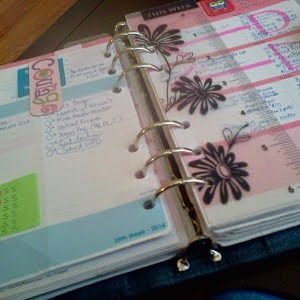 Consider adding a daily plan to your planner, sometimes, but only when needed. That said, daily pages might not be appropriate for you. Instead, use a daily plan made only the morning of or the night before, and maximize your planning. This is a really great idea. I always use weekly diaries and every morning I list out things I have to do on the day of the week. But I realise that sometimes I need more space. I think this "daily diary pages" idea could really help me without letting go of my weekly diary. Will try this out from next week. I do some big picture planner at the beginning of the week - Sunday evening. I plug in all the stuff I know I have to do. Then each evening I make a detailed plan for the next day. If I don't plan, I don't do.